At the last AGM, the CUUWA questioned if there was a possibility of linking the Lunapad’s Afripad program with Child Haven. It turns out Child Haven is producing low-cost sanitary napkins. Read on! CUUWA Child Haven’s MVP Program for Women, located in a low-income area in Ghaziabad, is fully funded by Child Haven. It has trained some 8,000 women in tailoring over the last 10 years. These women then make and repair clothes for their families, or find employment doing tailoring for others. They come for 6 months and learn on the center’s 22 machines, some hand-cranked and some foot-treadle powered. A year ago or so, Child Haven purchased equipment to make low-cost sanitary napkins, which the center is also now producing. Six women are trained to produce the pads, and 5 are doing the marketing. 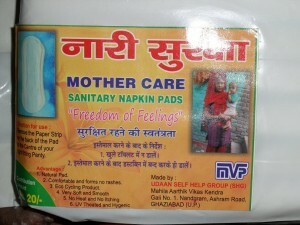 The pads are much less costly than those found in the market making them accessible to more women. The project has also offered family planning training to some 50,000 women including a focus on the value of girl children, asthe poster from their wall above shows. “I can make money anywhere but this work gives tremendous satisfaction, Ranji says. Canada’s 150th birthday in 2017. Glover, is also conducting roundtable community discussions. The CUUWA invites all CUC Congregations and Fellowships to dedicate all or part of their March 9 service (or one close to International Women’s Day). Superb ideas available. An unmistakable gender gap in political knowledge seems to be a global phenomenon. Read this article. “Dr. Morgentaler changed the legal landscape in Canada, and eventually led to the 1988 landmark Supreme Court of Canada decision that gave women the right to obtain abortion care,” said Vicki Saporta, president of the National Abortion Federation. The Pink Tea and CUUWA AGM were a great success. See Photos and details. On International Women’s Day, March 8, 2013 UN Women launched “One Woman: A song for UN Women“, a musical celebration of women worldwide, featuring more than 20 artists from across the globe. From China to Costa Rica, from Mali to Malaysia acclaimed singers and musicians, women and men, came together to spread a message of unity and solidarity: We are “One Woman”. Would you consider taking an online course? We have members willing to facilitate and/or teach such courses. Stay tuned for more information or leave reply on this page.